A big year in Brazil marked by huge street protests and a major corruption trial creates new tests for the country's democracy. In the end, the one certainty is that 2013 has shown Brazil to be both a vibrant and heavily mediatised democracy that thinks constantly about itself in a very competitive discursive environment. It has been quite a year in Brazil. The country experienced huge demonstrations as more than one million people protested in the streets. These were the largest popular eruptions since 1992, when president Fernando Collor de Mello was impeached. In addition, the biggest political corruption scandal (the so-called mensalão) since the end of the military regime in Brazil (1964-85) saw some powerful personalities of the ruling Partido dos Trabalhadores (Workers’ Party / PT) – including long-term comrades of the former president, Lula da Silva – being sent to jail, after their condemnation in 2012 by Brazil’s supreme court. Whatever mix of good and bad things emerges from 2013, none of what happened has been minor. This is most clearly true of the demonstrations, especially the ones on 17 and 20 June, when (according to even modest estimates) around 100,000 people assembled in the streets of Rio de Janeiro and 70,000 of São Paulo on the first night. There were also protests in the major Brazilian cities of Belo Horizonte, Brasília, Porto Alegre, Fortaleza and Curitiba. The signals of the drama to come were apparent at the beginning of June, when small protests against a rise in the price of public-transport tickets took place in the streets of the paulista capital and grabbed the attention of Brazilian media. The same issue had ignited popular demonstrations before in at least two other big cities: Natal, in August 2012, and Porto Alegre, in March 2013. In São Paulo, three small demos on 6, 7, and 11 June encountered harsh police repression and the prejudices of Brazil’s establishment media, which was quick to classify the participants as “vandals”. In a wider context of relative economic prosperity and consumerism, which much of the country had experienced since the Real Plan of former president Fernando Henrique Cardoso (1995-2003) and the social programmes of Lula (2003-11), it seemed that there was no space for political protests. The easy accusations of “vandalism” just as rapidly proved to be mistaken, however. In fact, they provoked further protests directly against the Brazilian media. A few days later, on 13 June, people took to the streets in São Paulo, Rio de Janeiro and at least five other capitals: Natal, Porto Alegre, Teresina, Fortaleza and Maceió. In São Paulo, the police crackdown was violent and at least 300 were arrested. Several people, including journalists, were injured in the clashes, and the photographer Giuliana Vallone, working for the newspaper Folha de São Paulo, was hit in the eye by a rubber-bullet. This was two days before the opening of the Fifa’s Confederation Cup in the country, thus in full view of the world’s media. On 20 June, in the middle of this global football tournament – which was to be known in Brazil as the “Manifestations Cup” – around 1.5 million people flocked onto the streets in more than 100 Brazilian cities. The protests’ origin in transport prices became swamped by an enlarged range of issues – including public benefits in general (health, education and security), political corruption, media concentration, and the spiralling costs of the Fifa’s World Cup in Brazil in 2014. Four months later, on 15 November, a crisis of another order reached its peak, as the Brazilian supreme court issued arrest-orders for twelve of the twenty-five politicians, bankers and businessmen condemned in 2012. 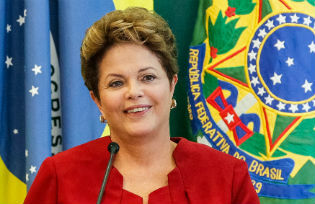 The trial, which began in August 2012, concerns the buying of representatives’ votes in the Brazilian congress in 2005-06. It involves high-profile figures such as José Dirceu, the Lula presidency’s former chief-of-staff, who was given ten years in prison and a fine of more than Rs 650,000 ($ 325,000), and José Genuíno, the PT’s former president, who was given six years in prison and a fine of almost Rs 500,000 ($ 250,000). The importance of the case lies not only in its size and the fact that it involves a ruling party and prominent former leaders, but in the historic role of Lula’s PT as both a beacon in the fight against Brazil’s military regime and a traditional bastion of decency in the country’s complex political arena. Hence, it will be no surprise if the image of politics itself suffers major damage among Brazilians, fed greatly by the conservative media’s “spectacularisation” of the corruption trial. So what good and bad things come from all this? First, the popular demonstrations of 2013 show that relative economic prosperity and consumerism are not enough. The protests were largely a networked movement of the urban middle-class, and as such brought attention to long-standing problems in the provision of public services in Brazil and in an over-centralised media environment; and to the need for more participative methods of decision-making in the country and the creation of multiple spheres of authority to rethink Brazil’s social priorities. Second, however, the protests fuelled non-democratic movements and encouraged the view that Brazilian politics had failed to address all the issues they had voiced. In the end, the one certainty is that 2013 has shown Brazil to be both a vibrant and heavily mediatised democracy that thinks constantly about itself in a very competitive discursive environment (which now, without any doubt, includes the internet.) This can be seen as a complex, diverse and unexpected background for 2014, when the country will experience its second Fifa World Cup in June, after its second place in 1950 and the defeat by Uruguay in the final match in Rio’s Maracanã, but also national elections for congress, governors and the president in October. 2014 promises to be as big a year as 2013 has been.